Rollin' down the river with Proud Mary and her krazy krewe! : Sick Noah...AGAIN! Remember my last blog post saying we were going back to recheck his ears? Last Friday when we went they were perfect ears! However, Monday came and we had quite a scare. My mom called me on my way home from work saying Noah felt warm. I got there took his temp and it was 102.5, which was high but not very alarming. I knew he had 2 teeth coming in so didn't think much about it. Later that night he was burning up, so I took his temperature and it was 103.1. 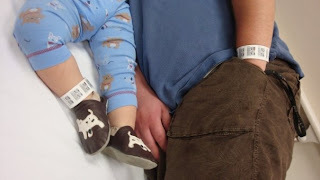 Being a worry wart since he never had fever that high I called the on call pediatrician. They told us to go to the ER. I so wasn't expecting that, so I got ready and we left. Before we did we checked his temp again and it was 103.6, so off we went to EJ. We checked in and everything was going fast and smooth until we got into the actual room and we waited...and waited. Thankfully Noah was sleeping, which was great because I'm not sure how he would have survived waiting that long in a stroller. Diagnosis: DOUBLE ear infection again! Seriously, he was well for 48 hours. It's been so hard with him being sick and moving, but we are doing it. He doesn't have fever anymore but still taking meds...stay tuned. Hoepfully we are over this!